It’s the start of school holiday this week. The Husband is planning to bring us for a short holiday in November. Both of us have difficulties in taking our annual leave in December because 1) V will be serving his reservist for one month, and 2) my office has a planned shutdown in end Dec – week of Christmas. We wanted to go to somewhere near, simple, short and hopefully, without the need for applying leave from work. So, the idea of going for a weekend cruise immediately came to our mind. We went for a cruise vacation on Star Cruise Virgo a year ago, and we really felt like going there again. Unfortunately, the price has increased so much in just one year’s time. The package price for a family of four on a 2N weekend domestic cruise costs a whopping $1800! With this price, I’ll rather buy three air tickets and fly to Hong Kong. So, we scrapped the idea of going for a weekend cruise. I told V that as long as we’re together, and with our dear son, anywhere is a good place. Any time that we get to spend together as a family is precious to me. He is most happy to hear that. We can reserve our resources to plan for a better holiday next year when our schedule permits. 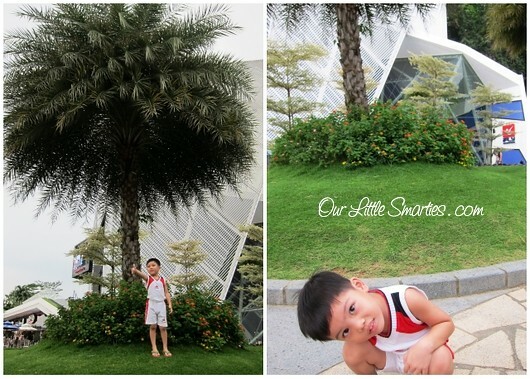 So, we brought Little Edison to Sentosa Island last weekend. 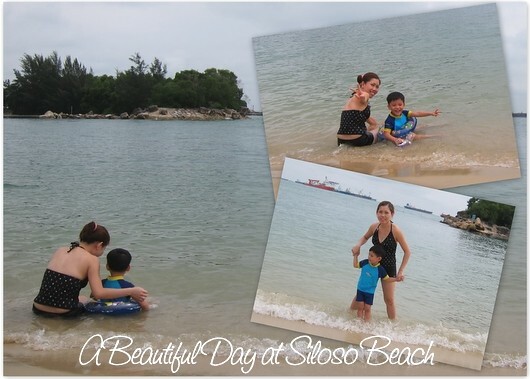 Together with our parents-in-law, we planned for a picnic at Siloso beach. Little Edison is so thrilled to swim at the seaside and play on the sandy beach again. 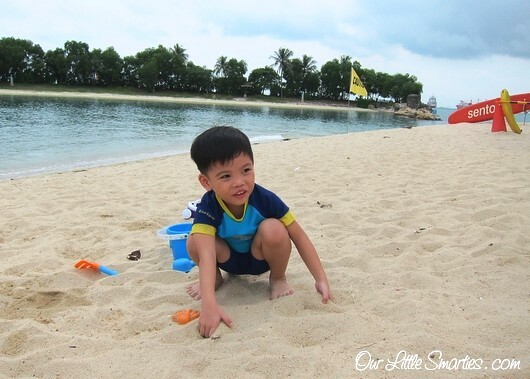 What he like most about the beach are 1) when the waves washed over his little feet, he will laugh with joy, 2) when the waves pushed him backward to the shore, he will shout with excitement and 3) he can play with the sand, draw them with his hands and even roll his body on them. The sand on the beach is so clean and fine. But there is just one thing that he hates about the beach. Guess what? It’s the shower facility in the public toilet that is not equipped with water heater. He just hates to shower in cold water. 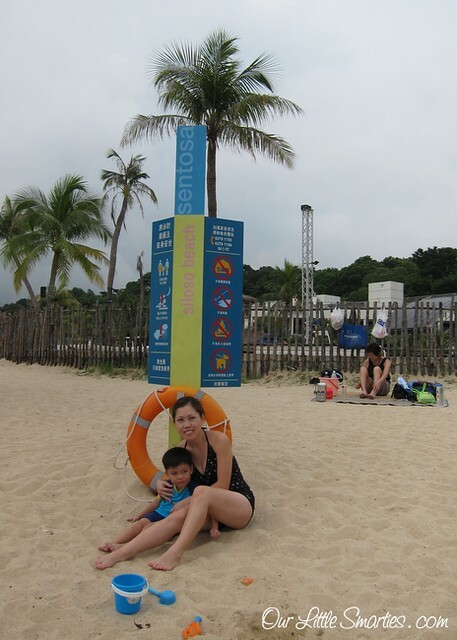 Little Edison and I at Siloso Beach – fantastic weather! totally agree! anywhere is good so long as the family is together. 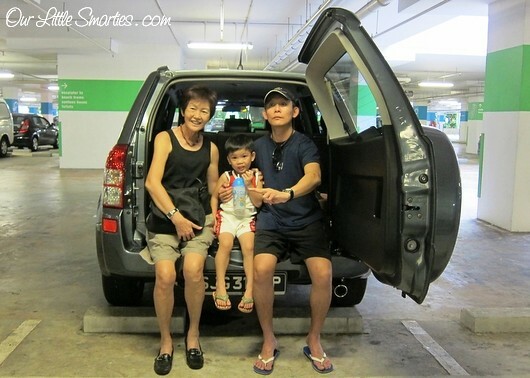 i would also opt for Sentosa! Oh no.. My stupid finger press the wrong button… There r lots of wonderful places in malaysia we have yet to explore!! My hubby dislike Malaysia and Indonesia. That’s why we don’t plan for vacation in these countries. Haha! Otherwise, Malaysia really has a lot of nice tourist spots within driving distance. Really beautiful.. u can consider..